I have very long hair and I use a wide-toothed comb. Over time, an astonishing amount of lint and dirt will accumulate in the teeth of the comb, and I normally pull it out with a tissue, and run it under some running water. If you’re feeling industrious and want to thoroughly clean the gunk out of your combs and hairbrushes, here are some ways to do the job right. Method 1: Use Baking Soda. Add a few spoonfuls of baking soda to a basin of hot water. If you only have a small comb, just use a cup. 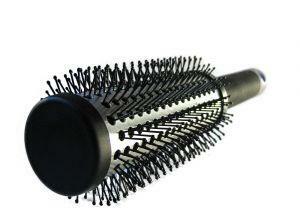 Soak the dirty end of your collection of hairbrushes and combs into the mixture and leave for 10 minutes. If you need to, use the ends of an old toothbrush to work out the gunk while they’re being soaked. Take out and rinse. Method 2: Use plain old shampoo. Take an old toothbrush and add a dab of your shampoo on it. Use the toothbrush to scrub out the lint from your comb. If you have hairbrushes, soak them in the sink with some foamy shampoo water. Method 3: Use vinegar. Soak the brushes and combs in a solution of vinegar and hot water for 10 minutes. The vinegar will strip the oil off the bristles. Method 4: Use dishwashing liquid. You can use this the same way as Method 2 above. I haven't actually tried this one yet... since well, I'd have to first stick some gum in my hair (and I'm not quite willing to do that). But I did find more than a few references to this coke-gum remedy online. And the method is simple enough. I am a make-up artist, and I know how inmportant are tools in the beauty industry, especially keeping them clean and santitized. Thanks for the tips. I will surely try them. Shampoo/bath wash with a soft toothbrush to clean it., rinse and gently wipe the it clean and let it dry overnight. One thing I have trouble with is fluff around the bristles. I used a long needle threaded with floss to lift up fluff from multiple bristles at one time. That’s an interesting method, thanks for sharing. Yes, the fluff can really get caked on over time!